I am using the 6th Chakra for these as a general use for 'seeing'. Melody, in her book "Love is in the Earth," is of the opinion that when used for gazing, they provide access to sacred text of the anicients. There are also references to Seer Stones in the old and new testaments in the Christian bible. It would seem to me that the use of stones in this manner has been occurring for a very long time and has been accepted across many spiritual paths. While the messages seem to be interpreted in many ways, there seems to be a common spiritual connection. For myself, I have now learned to listen when the stones speak. There are many times the message makes no sense to me but has been enlightening to the person I pass the stone and message along to. 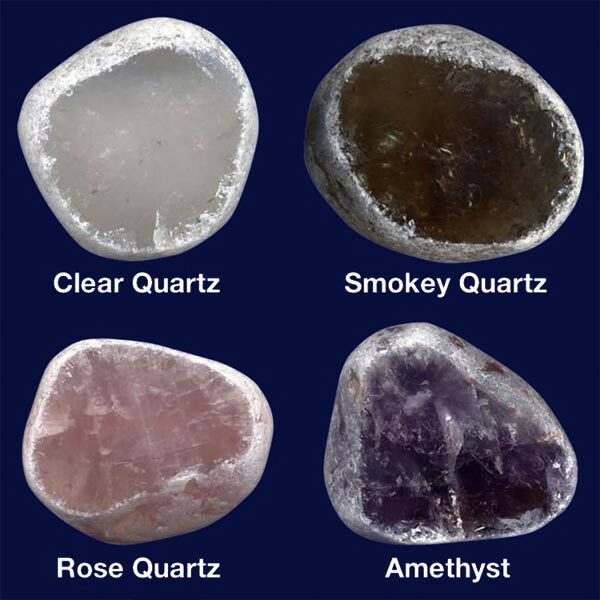 Generally Seer Stones are Quartz, Amethyst, Rose Quartz or Smokey Quartz. So, a Triclinic Crystal System. Occasionally a Labradorite can be found this way. Basically, these are naturally tumbled in streams flowing out from a mountainside. The Emu River in Brazil is probably one of the most famous for finding these. Being naturally tumbled in rivers seems to add a very earthy, warm energy to these stones. Basically we just slice a part of the stone off and polish that cut face so the interior beauty can be seen. When held, I not only feel a great connection with the earth, they seem to offer a broader connection to the heavens as well. Using them during meditation has been quite enlightening. They seem to stimulate a remembering of ancient knowledge and remind me that I still have much to learn. Using during quiet meditation while staring into the stone would be my best recommendation. It would seem that the use of these stones for scrying purposes has been occurring for a very long time and has been accepted across many spiritual paths. While the messages seem to be interpreted in many ways, there seems to be a common spiritual connection. For myself, I have now learned to listen when the stones speak. There are many times the message makes no sense to me but has been enlightening to the person I pass the stone and message along to. If you are using a crystal, or a ball of polished rock crystal for divination, the process would correctly be called crystallomancy. When utilizing this form of gazing or scrying, you may receive visions of various natures. They could be past or future events, and much would depend on what you focus your concentration on during the process. Some believe that the visions merely come from the subconscious mind. A place where the intangible is in focus and can be perceived in many different ways. This "mystical" experience displays the world through a different view than ordinary experience. There has been a long debate over what this implies. Does the experience actually transcend the phenomenal or material world of ordinary perception, or does it rather transcend the capacities of ordinary perception to bring the phenomenal and material world into full view. It will depend on which stone you choose to use and its specific qualities. There is not a generalized affinity for these types of stones. Elements of mysticism exist in most religions and in many philosophies, including those where the majority of the followers are not mystics themselves. See-ing through crystals is a practice actively used by many cultures and belief systems and is not limited to one tradition or ideology. I was surprised in researching this type of gem formation to find historic accounts that Joseph Smith used what was called Seer Stones for much of the translation of the Book of Mormon. He described it as two stones set in a silver bow and fastened to a breastplate and referred to them as Urim and Thummim. One of his revelations describes the earth as becoming a Urim and Thummim to all those who live upon it when it is sanctified after the last judgment. A white stone will be given to the faithful which will function as a Urim and Thummim to each individual that receives it. Although the term Urim and Thummim does not always refer to one specific instrument it seems. Apparently it can be the name given to different objects, but each seem to accomplish the same purpose. The names in Hebrew mean "lights and perfections." The plural nature of both words had led some Biblical scholars to believe that Urim and Thummim refer to the "process" of divination rather than an object. The use of the word in Mormonism though seems to be singular and indicates a device through which revelation is received.